Call it my overly active imagination but the very first time I saw the Bentley Bentayga, I immediately likened it to the Mountain, a character from the wildly popular TV show, Game of Thrones. Yes, it probably is overkill to compare a luxury SUV to a giant of a man who crushes his enemies' skulls with his bare hands, but the Bentayga truly is a giant among its peers. Happily enough the Bentayga is named after a mountain in Spain as well! With that out of the way, let's talk about this SUV of superlatives. It's the world's fastest SUV, the most luxurious and also the most expensive. Perhaps the only thing this SUV is not is good looking. That face looks every bit as shocking in person as it does in pictures. Predictably, Bentley didn't go after a completely new design language, but instead tried to emulate the presence, power and grace of the Continental series in an SUV stance. They got the first two spot on but grace...well there isn't much of that. Things get dramatically better once you look away from that awkward face with its four LED lamps. The side profile gets interesting lines and the trademark Bentley haunch has been nicely integrated in the rear three quarters. There are also some cool details like the rectangular tail lamps that light up in the shape of opposing Bs when the brake is pressed. Overall, the Bentayga won't win any beauty contests, but it attracts a lot of attention and successfully stands out from the sea of premium SUVs. Step inside and you instantly forget about the looks as your brain readjusts to the sheer luxury within. 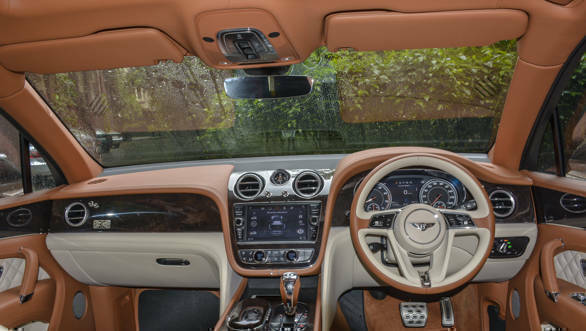 Inspired by the Continental, the wing-shaped dashboard is exquisite with a swooping centre console that sees high-quality wood, knurled metal and soft leather wrapping itself around a large touchscreen display. The trademark chrome stalks that control the aircon look and feel fantastic, as does the lovely leather-wrapped steering wheel. You are instantly aware that the Bentayga is a very special place indeed and the cabin elevates itself from the 'average' high-end luxury SUV. There's every luxury conceivable in here from ventilated seats with an optional massage feature in this car to dual sun visors that ensure passengers never get inconvenienced by glare through changes in direction! Naturally, almost everything within the cabin is customisable from leather and wood trims to add-on wine coolers. The rear section feels similarly special with lovely materials all around, but it's not quite as spacious as you might expect. Of course, it is nowhere close to being cramped, even for tall passengers, but in British super luxury speak it would be deemed as 'adequate'. This car we drove was loaded with many optional extras like the carbon-fibre trim on the outside and those groan inducing massage seats. The standout option though is the Naim for Bentley audio system. 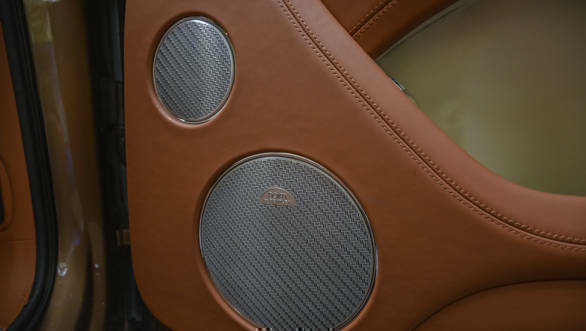 Bentley offers three audio options, and this one by the high-end British brand is at the top with 1,950W through 18 speakers and probably the best sound quality I've ever heard in an automobile. For video entertainment, Bentley will also sell customers an optional 10.2-inch Android-powered tablet that docks into the back of the front seats. The Bentayga is a seriously big car, and at 5.1m long it is even longer than the Audi Q7 with which it shares its platform. Despite the use of aluminium, which Bentley says, saves 236kg over a standard steel body construction, the Bentayga weighs in at 2,440kg. That's nearly 200kg heavier than the Audi SQ7 which packs a heavy V8 diesel engine. 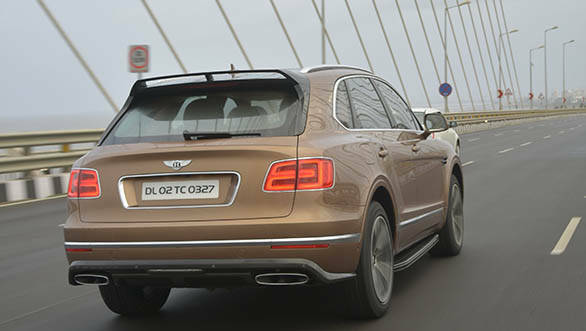 Despite this, Bentley claims this is the world's fastest SUV with a 0-100kmph time of 4.1s and a top speed of 301kmph! Making this possible is a brand-new 6.0-litre, twin-turbo W12 engine that weighs 30kg less than its predecessor but makes 608PS of power. Those are seriously impressive numbers, and that's about as much power as the Audi R8 V10 Plus makes. However, there is one more figure that completely blows my mind - 900Nm of torque which peaks from just 1,350rpm all the way to 4,500rpm. To put it into perspective, the aforementioned R8 makes 'just' 560Nm from its V10 engine. Hell, the 6.7-litre Cummins diesel from the Tata Prima 4928.S (the same truck you see hauling windmills and giant rolls of steel on the highway) makes 970Nm from 1,200rpm to 1,700rpm! Despite the Bentayga's ginormous dimensions and ridiculous numbers, it is very friendly to drive. The engine starts with a subtle but clear roar from the huge dual exhaust pipes. It's not brash like a supercar, but there's this deep and powerful hum that reminds of the fury available to the discretion of your right foot. At low speeds, the Bentayga is incredibly smooth and isolated, exactly what you would imagine from a fast limo. Throttle response is crisp but measured, and the car doesn't react angrily at the slightest twitch of the foot. Eventually though, you will put your foot down and that's when all of Bentley's claims make sense. 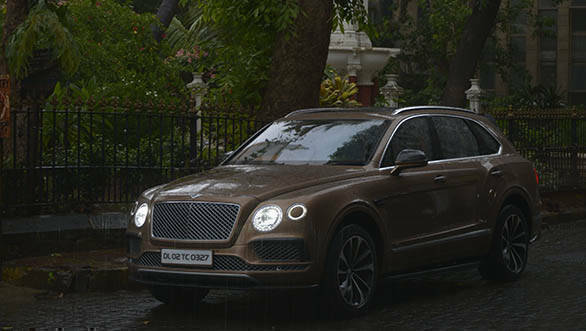 On the wet tarmac at the start of the sea link, which has some of Mumbai's best and grippiest road, the Bentayga was a beast. Flooring it from just over standstill, all four of the 285-section Pirelli Scorpion Verde tyres got together and told the ESP system to go to hell. Despite 4-wheel drive and the traction control being very much on, the big Bentley pulled a hilariously long burnout with ESP working overtime to put the power down as I was using the steering wheel to keep the car in a straight line. The torrent of power feels endless and I had to lift off eventually. 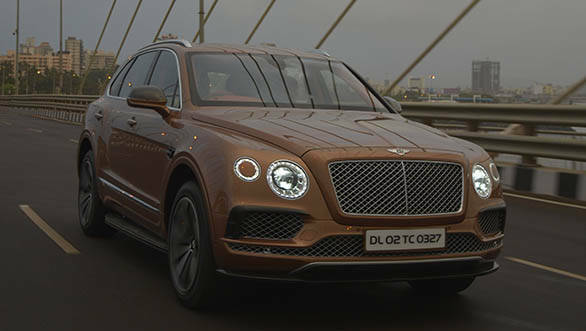 Despite not even experiencing half of her claimed performance, I have every right to believe Bentley when it says this is the world's fastest SUV. 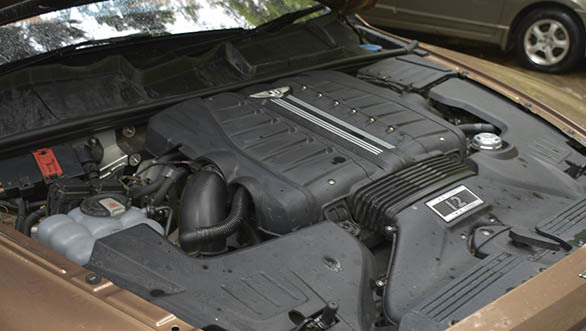 With such performance, it is easy to forget that this is first and foremost a luxury vehicle. The Bentayga's air suspension reflects that with its magic carpet ride quality. 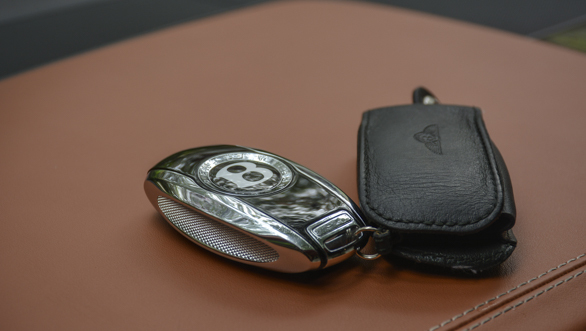 Excuse the cliche, but there really is no better way to describe how the Bentley simply glides over most roads. The suspension irons out minor bumps supremely well, and it's only through deeper and sharper potholes that it tends to thud a little. Even this is mostly noise and little sensation transmits through to the cabin. The Bentayga uses an optional 48-volt electric system that enables electrically controlled anti-roll bars. International reports suggest that the Bentayga corners almost flat when driven aggressively and that it is a surprisingly good handler. However, we only got a three-hour drive within Mumbai, so I can't tell you much about how the car handles on a good road and how its many driving modes help it off-road. The final shocker with the Bentayga, rather unsurprisingly, is its price. Base ex-showroom price in Mumbai is Rs 3.85 crore. But no one in this segment buys the base model without throwing a bunch of extras at it. It's not hard to add nearly another Rs 50-80 lakh to the base price by doing so. Then you add roughly 25 per cent for insurance and Maharashtra's exorbitant tax and duty structure, and suddenly you have an on-road price that hovers dangerously close to Rs 6 crore! Money aside, another thing worth considering is the customer mindset at this price range. 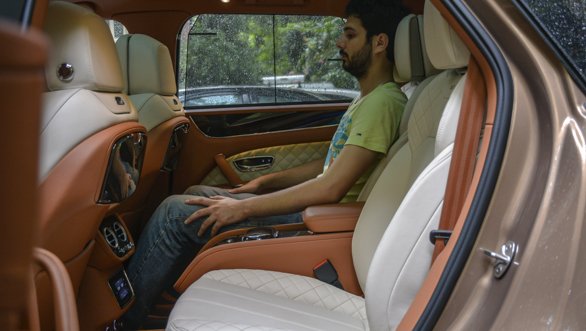 Yes, we Indians absolutely adore SUVs even if they cost upwards of Rs 1 crore. But at such a rarified point in the market, the average owner is usually cocooned in the limo while the SUV is driven by the bodyguard! It'll be interesting to see how this SUV is accepted in India. Initial impressions are positive - all Bentaygas allotted for India (about 25) this year are sold, and the waiting period for a new one hovers at nearly a year. It's good to be rich!